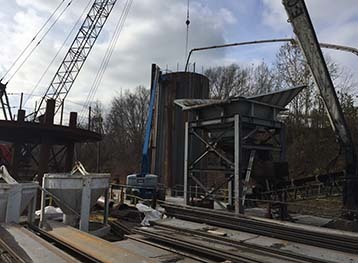 Aquarius Marine was the Prime Contractor for the demolition of two sheet pile mooring cells and the construction of two sheet pile mooring cells for Carmeuse Lime and Stone at their Black River Facility on the Ohio River, in Butler, Kentucky. 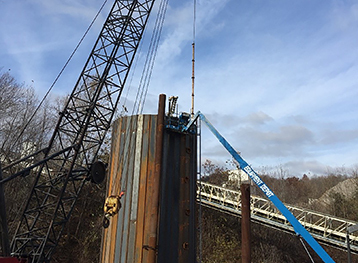 The new 22’ diameter cells were to be constructed using 95’ long PS27.5 steel sheet piling, filled with aggregate, and topped off with a 12” think reinforced concrete cap. 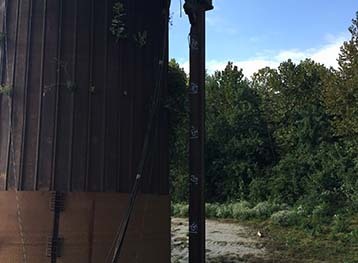 Prior to pile driving, higher than expected elevations for top of rock was encountered, resulting in a redesign assisted by Aquarius Marine. Demolition of the existing cells was reduced to a small section along the top of the cell. The sheets installed were shorter than anticipated and used to replace a third cell at the site. The annular area between the existing cell and the new cell was filled with tremie concrete. A small amount of stone was used to place on top of the existing cell, within the new sheet pile cell and a concrete cap topped off the cell. Handrail and mooring rings were installed along the dock line as well as 24” diameter guide pipes similar to the existing guide pipes. Aquarius Marine also dredged approximately 500 CY of material around the mooring cells. 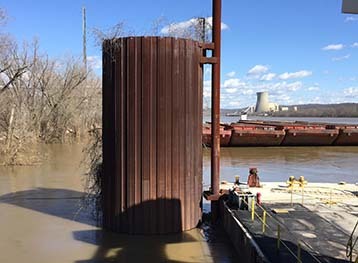 All work was complete from a floating plant on the Ohio River, with concrete for the job being pumped from the shore.